Trees are our business at Wichita Tree! We handle everything from root to crown, including the pesky stump left in the unfortunate event that a tree has to be removed. 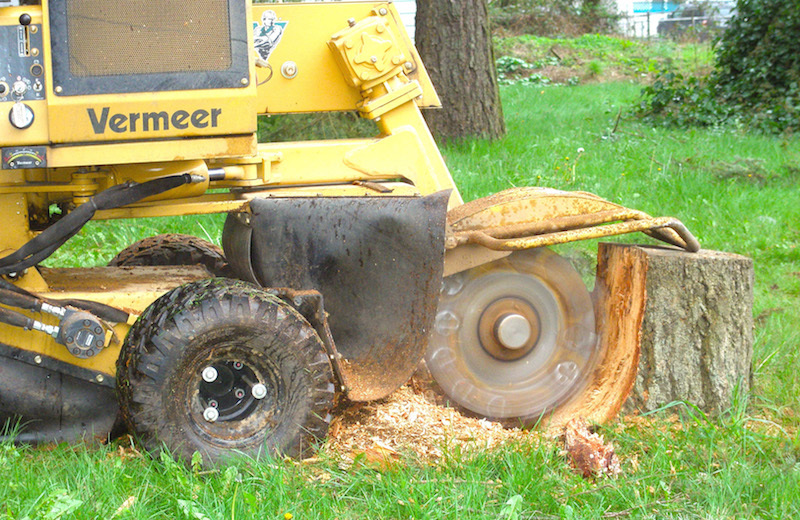 Call us today for first-class stump grinding! A perfectly landscaped lawn can be ruined by one or two stumps sticking out of the ground. You can wait (forever) for it to rot away OR… You can call Wichita Tree and have it gone in no time! In minutes, we will grind the stump down until it is lower than the surrounding soil. The second step is to then backfill the hole with the wood chips created from grinding the stump, or we will fill the hole with soil to encourage grass to grow where the unsightly stump once stood! The choice is yours! In some cases, grinding the stump may not be your only option. There may be another way! No one likes the look of stumps sticking up all over their yard. Now you have a solution! Call Wichita Tree today to find out all of your options, or fill out our contact form. We will get back with you to schedule an absolutely free consultation at your home! If you are needing a quote on removing your tree stumps, give us a call at 316-226-8733 or fill out the form on this page!